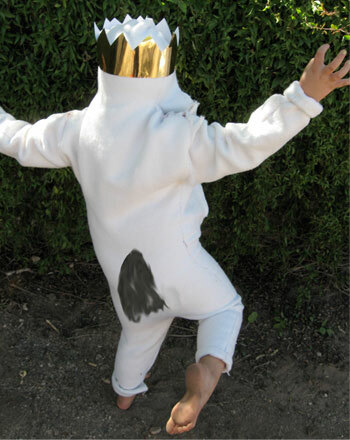 This Where the Wild Things Are costume will make your little wild thing look just like Max! This surprisingly simple DIY costume will save time and money, and it's also a great way to celebrate the classic Sendak book. This Where the Wild Things Are costume doesn't require any complicated patterns or equipment, and can be made with the help of your little Max or Maxine. Craft this Where the Wild Things Are costume for Halloween, playtime, or even bedtime, and let the wild rumpus start! Note: You can use the same instructions to make other wild things costumes too, by switching up the color of your fur and the headpiece. Fold your furry fabric in half. Fold the sweatpants in half lengthwise so that the legs are directly on top of each other, making one leg. Lay the folded pants on top of the furry fabric so that the outer seam of the pants is lined up with the folded edge of the furry fabric. Cut your furry fabric along the sweatpants, from the waistband to the hem, using the sweatpants as a guide so that you have one leg cut out in fur. Repeat for the other leg. Now it's time to make your fur suit! (You'll no longer need the sweatsuit from this point on.) Now pin the insides of each fur pant leg together and sew up the inseam of each leg. (You won’t have to sew the outside seams since you cut the fabric on the fold.) Sew up the front and back seams, connecting the two legs together to make pants, but leave the top opening of the pants alone. Press the seams flat with an iron or your fingers. Pin together the sleeves and sides of the shirt, and stitch them together. Pin the neckline and hem it to make it even, or you can simply even it out with scissors. Press the seams flat with your iron or your fingers. Have your child try on the two parts of the costume. 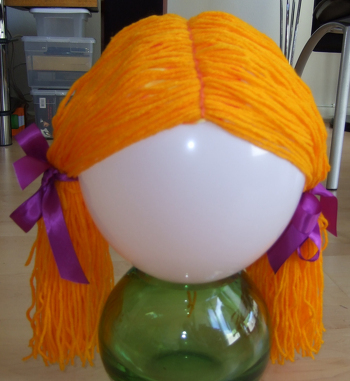 Figure out where the top and bottom should join for the best fit and fasten together with safety pins. (This is how you’ll get the costume on and off.) You could also attach Velcro to the two parts to connect them or sew them together and add buttons down the back. Pin your tail to the rear of the costume. Now it's time to make Max's hood. You can use a hood from a sweatshirt or jacket to do this or just cut a hood free-hand so that it is semi-snug on your child's head. Fold up the bottom inch of the hood, stitch it and slip a ribbon through it so it can tie under the chin, or just leave it loose. Cut out two triangles for wolf ears and stitch them to the top of the hood on either side of the head. You’re almost done! Have your child use scissors to cut out a tall crown from the gold paper so that it will fit over his hooded head. Fasten the crown with double-sided tape. You're done! All that's left to do is have your child take his Max costume out for a spin on Halloween while he trick-or-treats the night away! If your child knows how to sew, allow him to help sew some of the costume himself! For some extra inspiration, you and your child can go see the movie or read the book together or both! Make things simpler with these spooky DIY invitations. Decorate these colorful creations to delight your guests! Wild Path doesn't hope that a trail will get him places; he makes his own paths! You decide where he goes, and write about it on the back of this page. What better way to celebrate Halloween than with a costume party? Gather all the ghosts and goblins of the neighborhood to celebrate! 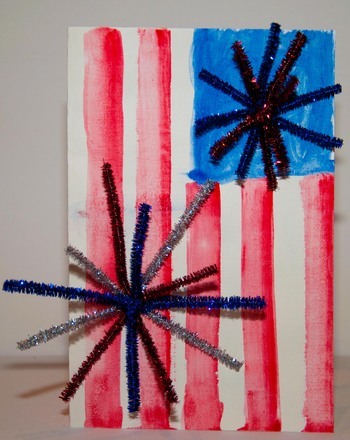 Create a dazzling DIY Independence Day Cards and hand them out to friends and family members. Where in the world is the super secret location? Where in the world is the mysterious location this time? Solve the addition problems to decipher the secret city, country and continent! Ready for another round of where in the world? Be an international math detective as you solve addition problems to discover the secret location!